Today we’re showing you three creative ways to use the Banner Punch Board from We R Memory Keepers! As well as creating a range of banner shapes such as pennant, banner and crest in a variety of sizes, you can also create boxes, tags and card shapes – all you need to do open the board, pop your choice of paper inside and get crafting! With this banner punch board you can really take your paper crafting to the next level, but you don’t have to be a pro to use this tool - as we show you in our tutorial below, it’s really easy to create something magical! Maxine is going to take you through a creative gift box make using the wonderful First Edition Wanderlust paper pads and we’ve also got a few more fun ideas below to really help you get the most out of this tool! 1. Cut two triangle shapes using the banner punch board, starting at the 7” line. 2. Score a 1cm line down each long side of both long sides of the triangles. 3. From the top of the triangle, measure 12cms and 13cms. Score along the 12cm line, and cut along the 13cm line so that you remove the tip of the triangle. Fold along all of the score lines. 4. Cut a 5cm strip of paper from the 12” x 12” Wanderlust pad. We used a contrasting paper design. 5. Adhere the flaps from the two triangles to the 5cm wide piece of paper to create a box shape. Score the flap of paper at the bottom corners of the box as you go. 6. Cut off the extra piece of paper from the end of the 5cm strip once adhered. 7. Take a 9 x 16.5cm strip of paper and score it at 2cm on each side and cut into the corners as shown below. This will form the lid of the box. 8. Adhere one side to the inside of the box, and then adhere the other sides of the box together to create the lid. 9. Using the First Edition Frames dies, die cut a frame from two different paper designs and adhere these together. Stamp a sentiment on the paper frame and adhere this to the side of the box. You now have your completed box! We added a paper flower to finish this design - and you can decorate your finished project however you like! We created this wonderful banner wall hanging that doubles as a friendship flip book. A number of pennants have been attached together with metal rings to create a flip book with added pockets inside for storing photographs or quotes. A perfect gift for your loved ones! It’s also so easy to create beautiful cards with this tool! Here we cut a 6” x 6” card blank and layered a variety of papers to create this stunning design. The banner punch tool has here been used to create the pocket for this super stylish greetings card! 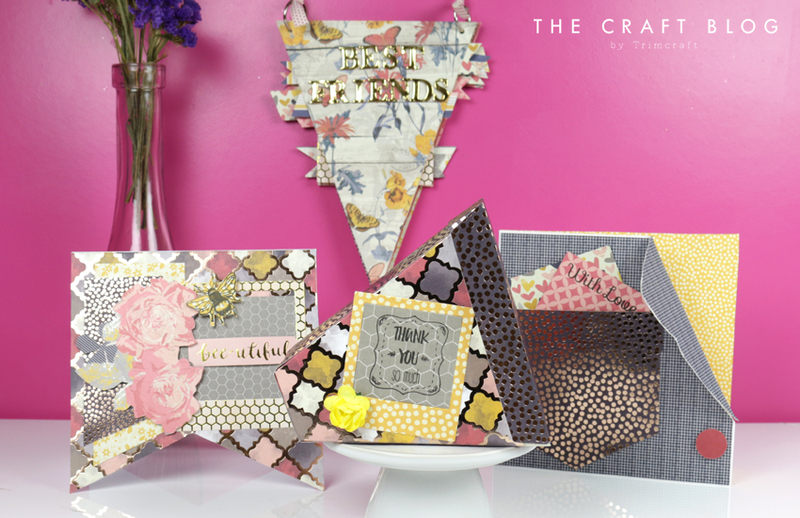 We’d love to see We R Memory Keepers makes, so don’t forget to #trimcraft when sharing on social media and to share your makes in the Inspiration area. Thank you! We're so glad that you like them! We're happy you like this :) If you give it a try we'd love to see it on the inspiration page!